"He has done my strategic, task-related services correctly & economically the first time." 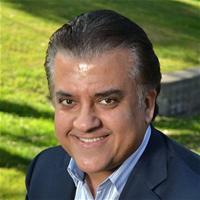 Sanjiv currently serves as Managing Attorney of InnovaTech Law Group, a law firm specializing in the legal and strategic business advisory needs of leading edge technology focused companies in Silicon Valley and San Francisco Bay Area. Sanjiv has over 28 years of broad-based business and legal experience in all areas of transactional law relevant to startup to fully mature technology companies with a particular focus on corporate, securities, employment, intellectual property, and general business law. He has been an entrepreneur himself in several startup ventures so he understands the challenges of that environment and is able to offer… read more practical and tested solutions to his clients. "Always efficient and executes professionally." "Sanjiv and team have been very responsive and professional. We have enjoyed working with them very much." "Sanjiv and Rafa are great"
EG&E, LLC and ELV, Inc.